1. Rinse the arugula and dry it well, if not pre-washed. 2. Add the arugula to a salad bowl, pour the olive oil over it and mix well to coat all of the leaves. 3. Add salt & pepper and mix well again. Preparation time, 20 minutes; cooking time 45 to 55 minutes. 1. 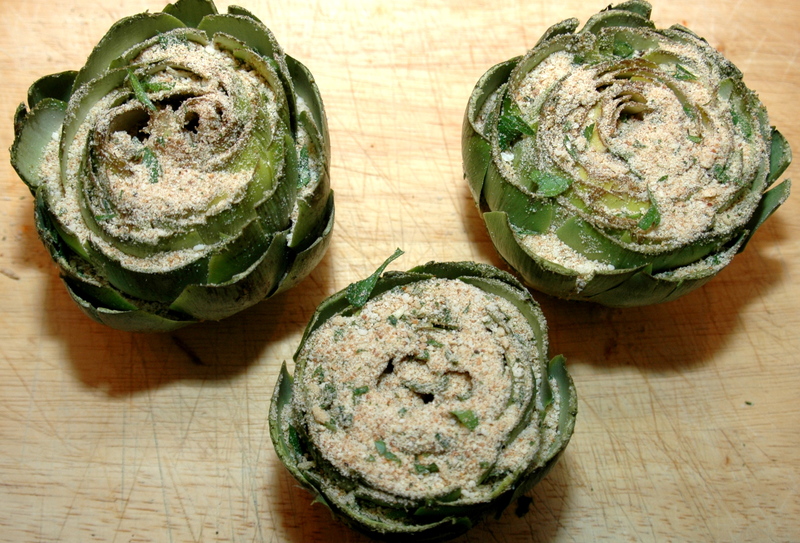 With a sharp knife, cut off the top 1 to 1&1/2 inches of each artichoke. 2. Remove the outer bottom leaves and snip off all points of the other leaves with kitchen shears. 3. Remove the stems, cut off the bottom 1/2 inch and peel and slice them lengthwise into quarters or thirds, depending on thickness. 4. In a mixing bowl, add the breadcrumbs, cheese, 2 tablespoons of garlic, parsley and pepper and mix well. 5. Pull back the leaves of each artichoke and drizzle 4 tablespoons of olive oil into the leaves of each. 6. With a teaspoon, add the breadcrumb mixture to each leaf. 7. Insert sliced stems into center. 8. Place stuffed artichokes in a 5 quart pot with a cover and add the chicken stock, white wine, lemon juice and 1 teaspoon of garlic. 9. Cover pot and bring liquid to a boil, reduce heat to medium-low and steam the artichokes covered for 45 to 55 minutes, until leaves are easily removed from the artichoke. 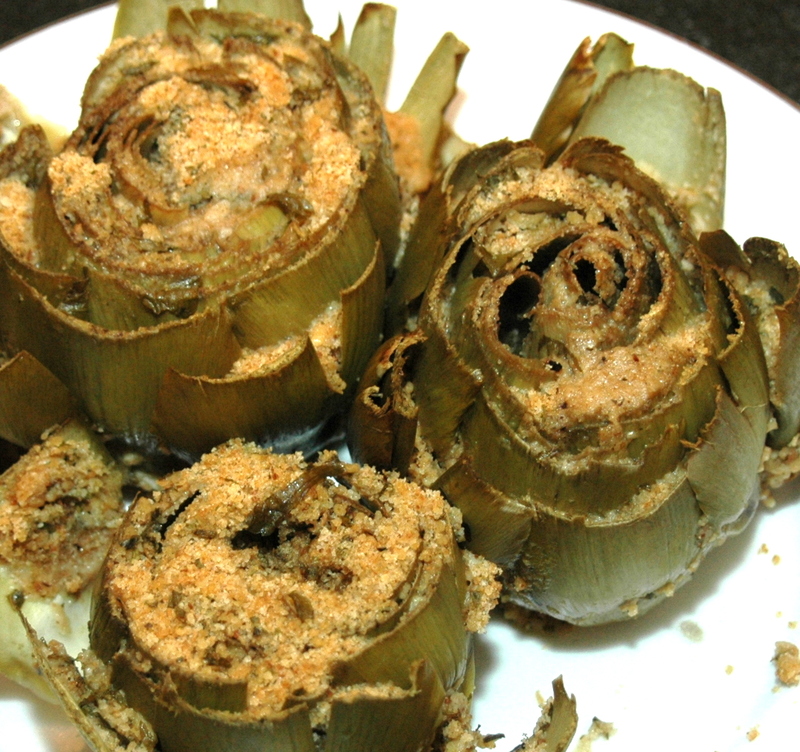 Please watch video on How to Eat an Artichoke , but with our recipe there is no dipping required. Also see: A Pre-Thanksgiving Meal. 1. Bring 4 quarts of water to a boil in 5 quart or larger pot. 2. 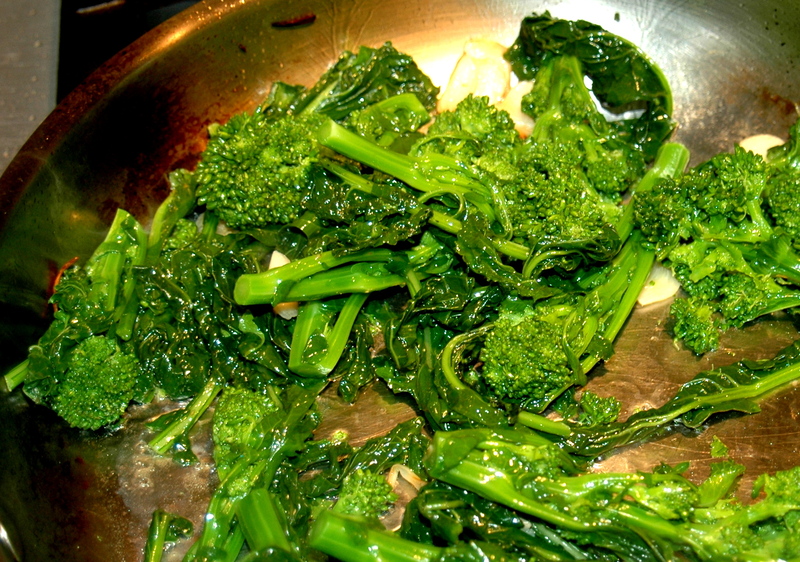 Rinse the Broccoli Rabe, discard the thick stems by cutting about 3 inches off the bottom of the bunch. 3. 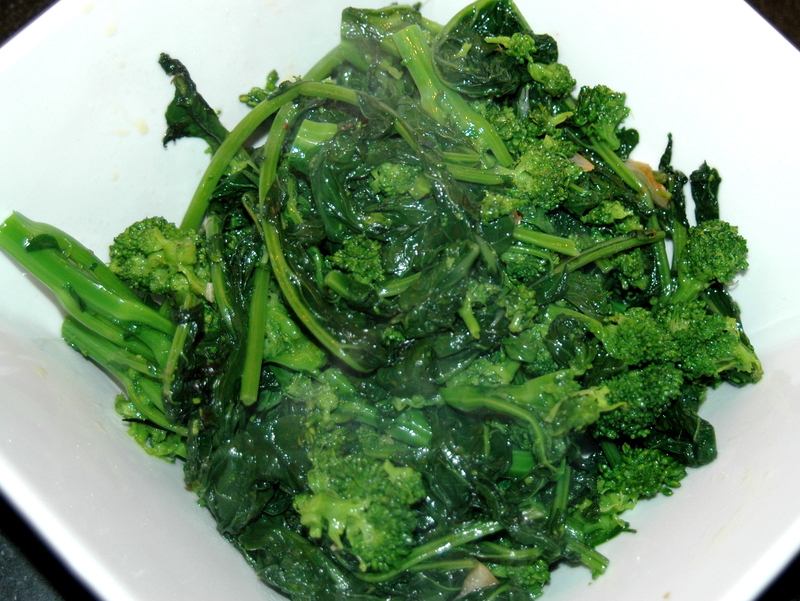 When the water comes to a full boil, add the Broccoli Rabe and blanch it for 60 seconds. 4. 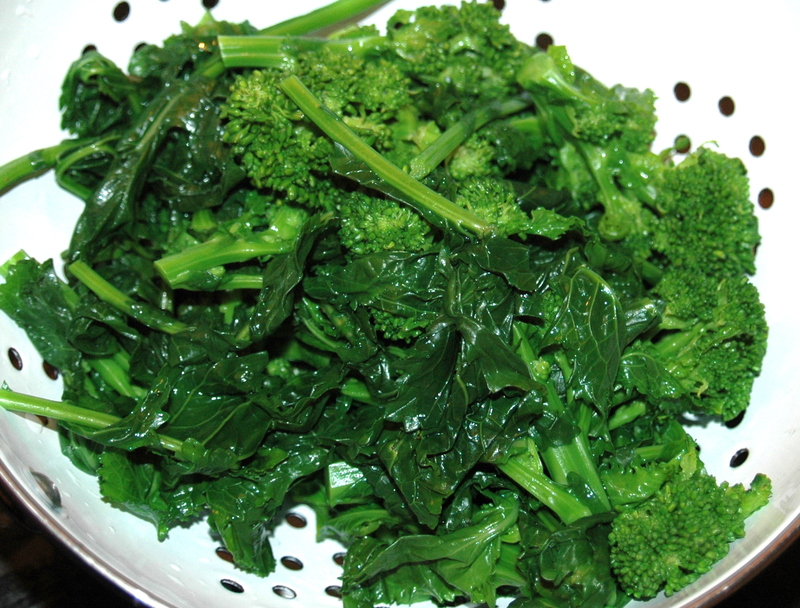 Strain Broccoli Rabe in a colander, and then plunge it immediately into a bowl filled with ice and cold water to stop the cooking and to retain its dark green color. 5. When cooled, transfer to a colander and drain until ready to sauté. 6. In a sauté pan with low curved sides, heat the olive oil on high flame. 7. When oil is shimmering, add the garlic and quickly sauté; do not let it brown. 8. When the garlic is translucent* add the broccoli rabe and sauté for 3 minutes, tossing constantly with tongs. 9. Remove from the pan with tongs and serve immediately. Eat it! It's Good for You! *Variation: At this point add ¼ to ½ teaspoon crushed chili pepper, depending on taste, to the oil-garlic mixture before adding the broccoli rabe. Also see: Eat it! It’s Good for You! That was Big Mike’s call for dinner when he made his favorite Lentil Soup. Lentil Soup in those days, many years ago, meant opening a can of Lentil Soup, pouring the contents into a pot, taking several hot dogs, slicing them, adding them to the soup, heating the soup until the hot dog pieces puffed out, and then calling out to the family…’SOUP’S ON!’ I thought it was delicious, which was probably due to the fact that it must have contained three days’ worth of sodium. 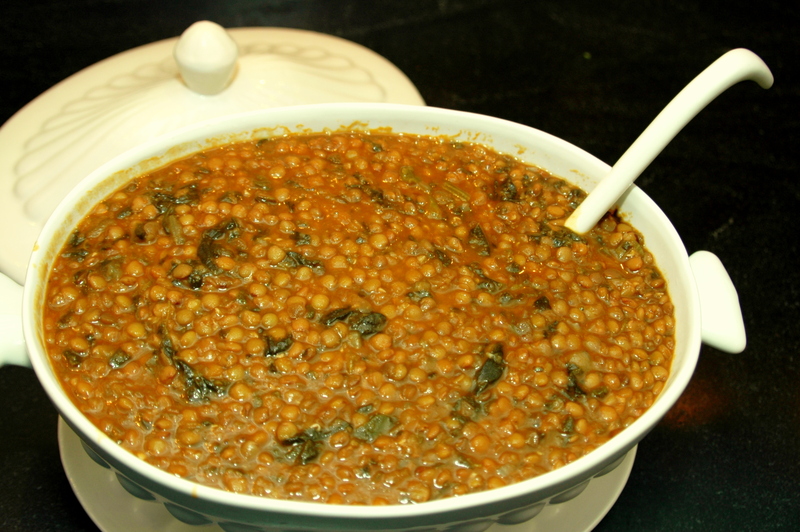 Lentil Soup has nothing to do with the period of 40 days preceding Easter. From what I have read, lentils have been around for about 10 millenia and their name is derived from the plant Lens culinaris, of which lentils are the edible seeds. With the first days of winter only weeks away, soup is on the mind. So off we went to the supermarket to pick up the ingredients for Lentil Soup. This Lentil Soup takes a little more time than opening a can and heating its contents, but actually not much more time. The recipe came from Uncle Fred, who always had a few containers of it stored away in his freezer and which he generously shared with us upon our arrival at The Cape for the summer. Now I find myself assuming the role of Uncle Fred as I await the arrival of my children this Thanksgiving. Active time, 30 minutes. Soak lentils overnight. Cooking time, 1 hour. Makes 6 quarts. 5 cloves garlic chopped fine, about 2 tbsps. 1. Add the lentils to an 8 qt. pot, cover with water to about 4 inches above the lentils and soak overnight. 2. The next day, drain and rinse the lentils and rinse the pot. 3. In the rinsed pot, heat the olive oil on medium, add the onions and garlic and lightly sauté until translucent, do not let brown. 4. Reduce heat to medium-low and add the tomato paste, mix well. 5. Add the contents of one Lipton soup envelope and stir. 6. Add the lentils and mix well. 7. Cover with water to about 2 inches above the lentils, about 3 quarts, and then add the ham hocks. 8. When the water comes to a boil, add the spinach, reduce the heat to medium/low and simmer uncovered for 1 hour, stirring occasionally. 9. When the soup reaches your desired thickness, remove the ham hocks and discard them, (see note). Add more water if too thick to your liking. 10. Serve the soup with olive oil drizzled into it and warm crusty Italian bread on the side. 11. Freeze the remainder in 1 or 2 quart containers to enjoy for those nights when you don’t feel like cooking. Note: As an alternative, if the hocks are particularly meaty, you can remove the meat from the bones, chop it coarsely and add it back to the soup, discarding the skin and bones. You may also wish to use fresh ham hocks, rather than the smoked variety, in which case the meat will be much more tender and definitely worth adding to the soup when thoroughly cooked, however the soup flavor will differ. Try it both ways, each method has its merits. 2. 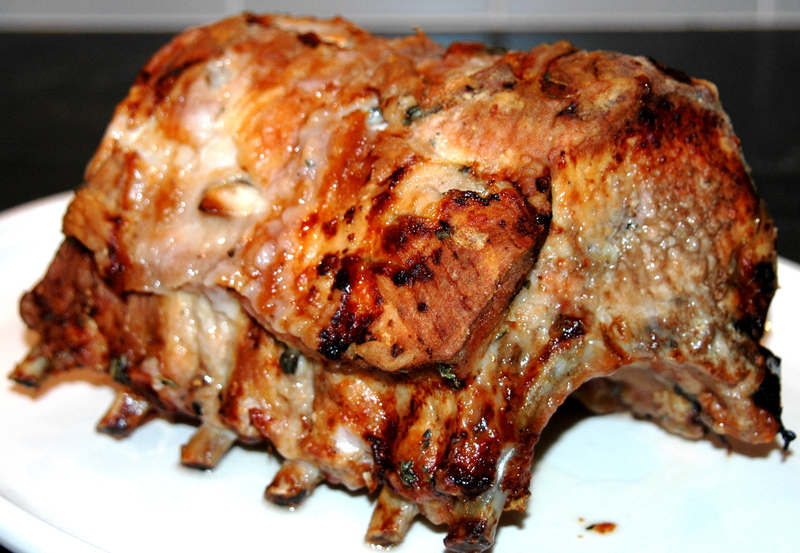 Rub pork roast with 1 slice of garlic. 3. Make 8 to 10 incisions on top side of roast and insert garlic slices into incisions. 4. In a large plastic bag, place flour, herbs and pepper, shake well to mix. 5. Add pork roast to bag and shake to coat roast evenly with flour mixture. 6. Place roast on a rack in a roasting pan and with your hands, spread some of the extra herbed-flour over the top of the roast. 7. Place pork roast in the oven and cook for 15 minutes at 450 degrees. 8. Lower heat to 350 degrees and continue cooking. After 2 hours, pour the wine over the roast and continue cooking for 15 minutes more. Insert a meat thermometer into thickest part of the roast, being careful not to touch a bone. The roast is done when the thermometer reads 160 degrees. Remove the roast to a platter, cover it with foil and let sit for up to 15 minutes while you make the gravy. 9. Pour off the liquid from the roasting pan into a fat separator and when the fat rises to the top, pour the juices back into the roasting pan. Place roasting pan on stove over medium heat, strain 1 tablespoon of flour into pan as you constantly scrape up the pan drippings. When gravy is thick enough to a spoon it is finished. 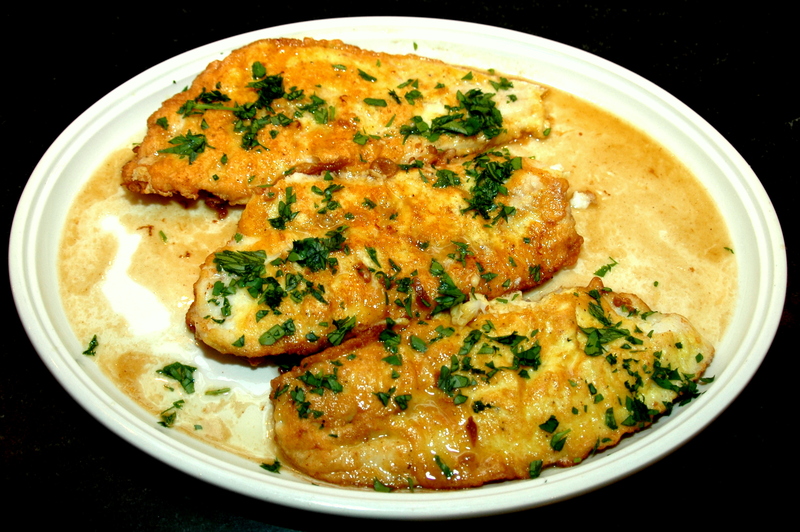 Serve with Roasted Rosemary Potatoes, prepared red cabbage and prepared apple sauce. A frothy glass of beer, such as a Weissbier, rounds out the meal perfectly. Two 28 oz. packs (6 cups liquid) of Swanson Beef Cooking Stock (no sodium or less sodium variety). 1 lb. sliced cremini (also called Baby Bella) mushrooms. 2. Lightly sauté garlic, celery and onion in butter until softened. 3. Add the meat to a large mixing bowl. 4. Add the sautéed vegetables, chopped fresh herbs and breadcrumbs, mix well by hand. 5. Add the sour cream, eggs, Worcestershire and Chili Sauce and black pepper, mix well by hand. 6. Grease a 3 lb. loaf pan and transfer the meat loaf mixture to the loaf pan, patting it down to remove any air pockets. 7. Cook in oven for 75 minutes until internal temperature is 160 degrees. 1. In a 3 qt. sauce pot bring the 6 cups of beef stock to a boil, and reduce by ½ from to 3 cups. 2. Melt the butter in a non-stick pan, sauté the mushrooms until golden brown. 3. Add the dried thyme and wine to the mushrooms and reduce the wine to about ½. 4. Transfer the mushrooms and wine to the reduced beef stock. 5. Bring stock to a boil and slowly whisk in the Wondra or flour, 1 tablespoon at a time. When the meatloaf is ready, remove it from the pan and set aside, keeping warm. Pour the pan juices into a fat separator (there may be as much as 12 oz.) and let the fat separate. Add the de-fatted pan juices and any solids to the gravy. 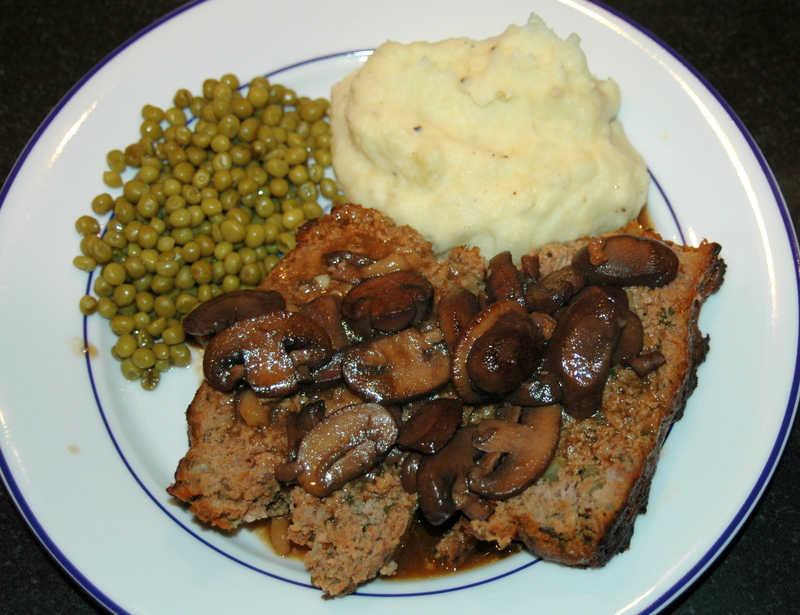 We served this with mashed potatoes and LeSueur Baby Peas, real comfort food for a chilly night. A great wine to make this meal even more special is a fruity and intense Amarone Della Valpolicella! Please refer to: Meatloaf for Dinner! Again? Meatloaf was a staple meal growing up. We were subjected to it at least 2 or 3 times a month in my family. I guess it was cheap and easy to make. However, it was always dry and tasteless. To compensate for that, prior to being baked, it was smothered in ketchup and draped with bacon. This didn’t help or do much to enhance the flavor or even make the meatloaf palatable. As a result, I avoided meatloaf for many years. My rediscovery began in a diner, when a friend of mine ordered it and I laughed at him while pantomiming sticking my finger down my throat and making false gagging sounds. He just knowingly smiled, as he enjoyed his dinner and I behaved like a jerk. Before he devoured it entirely, along with fluffy mashed potatoes and obviously canned string beans, he offered me a morsel smothered in mushroom gravy. Eureka! This was unlike any meatloaf I had ever tasted previously. A few years later another friend, a New York City Firefighter, introduced me to his special firehouse meatloaf, which was made with applesauce. Amazingly, it was not dried out and it was delicious. Thus began my hunt for how to make the perfect meatloaf. The first thing I discovered was that ground beef, the classic ingredient in all of the meatloaf I had growing up, was too dry and its dryness was compounded by the addition of too many breadcrumbs, which are needed to bind it together. So step number one, reduce the quantity of breadcrumbs and supplement the ground beef with other ground meats that retain their moisture upon being baked; ground veal and ground pork together fit the bill. Next for even more moisture I did use ketchup (later replaced by Chili Sauce), but rather than pouring it over the top, where it basically dried up in the oven, I added it to the mixture. This was supplemented by a bit of sour cream and the overall flavor was enhanced by the addition of Worcestershire Sauce. Finally, I figured that some fresh chopped herbs, particularly sage and thyme would certainly help in the flavor department as well. The end result is: Not Your Mother’s Meatloaf. For the ultimate comfort food meal, serve it with mashed potatoes and a green vegetable of your choice. Wouldn’t mother be surprised?